8 ch IR remote control relay card with programmable RC5 code iR-8R-V.
Our new 8 channel infrared IR remote control card iR-8R-V can be programmed with your own RC5 code. The programming of the code can be done easily through the on board jumper setting. The 8 channel IR remote control board is also having facility for All ON and All Off apart from the Toggle mode & Momentary mode for the Relay groups. 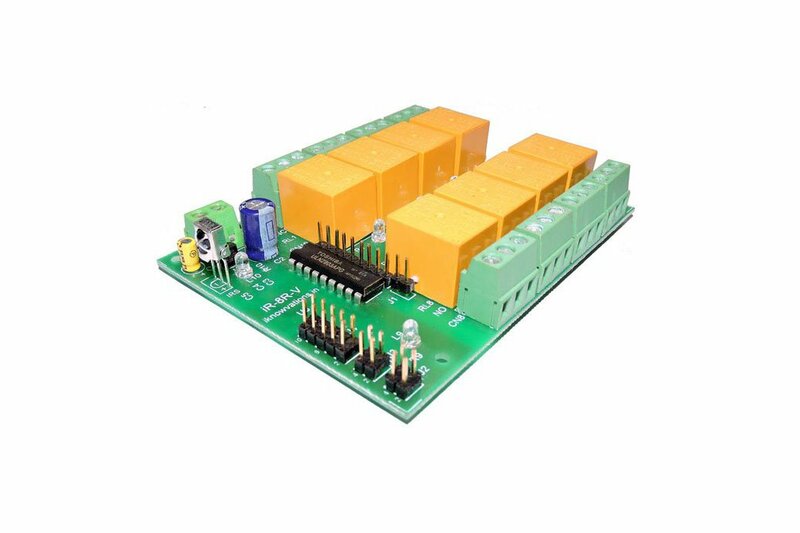 These features facilitates you to control total 8 * 32 * 4 = 1024 relays without interfering with each other. 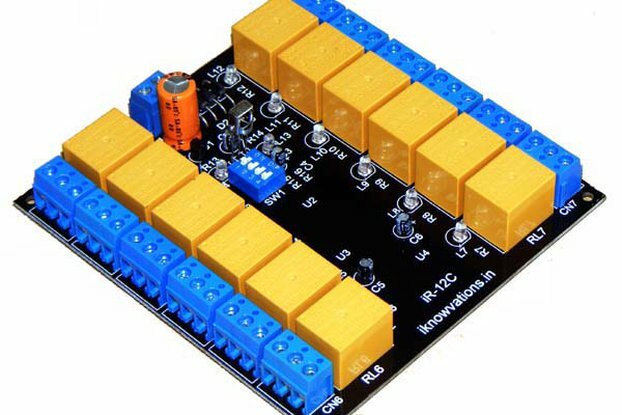 The 8 channel IR remote control board iR-8R-V is using RC5 coding system. The RC5 codes have 5 bits allocated to system group and 6 bits allocated to command group, out of total 14 bits. 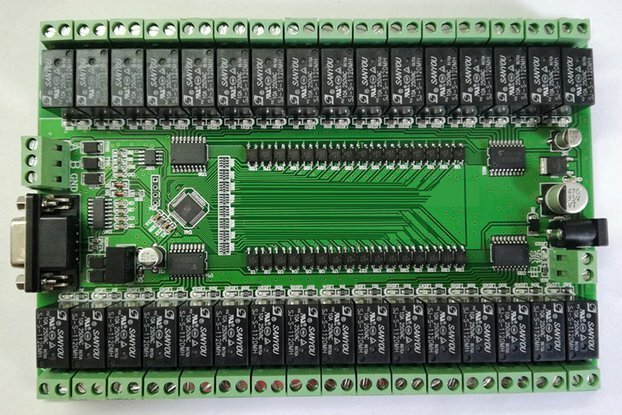 You can provide the system code bits through the jumper settings and each command group can control up to 4 boards having 8 on board relays. All these boards have their own All On & All Off button codes so that you can individually make all the relays of a particular board either ON or OFF with a press of a single button. 8 on board Relays, each having its own connector. On board system code programming jumper. On board command group programming jumper. Facility to make relays operate in Momentary mode or Toggle mode. Operates from 12 V DC power supply. On board 5 V DC regulator. LED indicator for Power and Proper Signal Receipt. Compact size of only 101 * 74 mm. There are additional 8 output pins which are parallel to the relay which can be used to control DC loads like motor or LEDs etc. 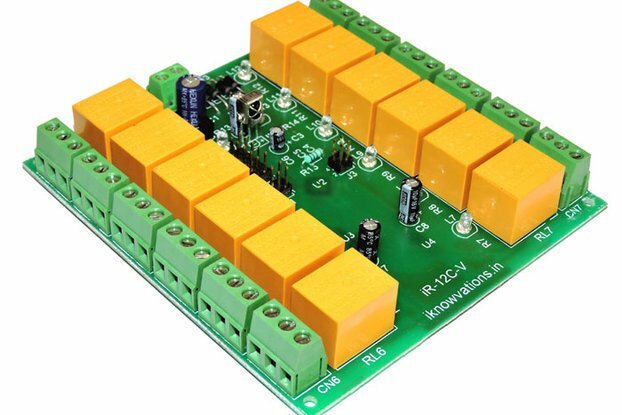 this way you can bypass the relays and directly control other DC loads which can operate in 7 to 15 V DC range. The Relay power enable jumper which can be used to cut off power to the on board relays to use the additional power output pins. 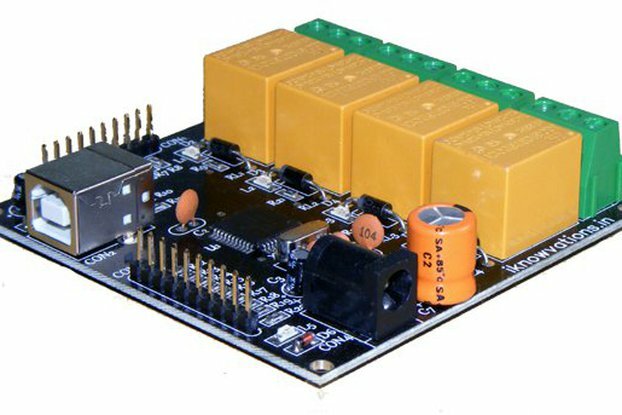 With this board you can make any electrical equipment operating on either 230 V AC or 110 V AC, infrared IR remote controlled. 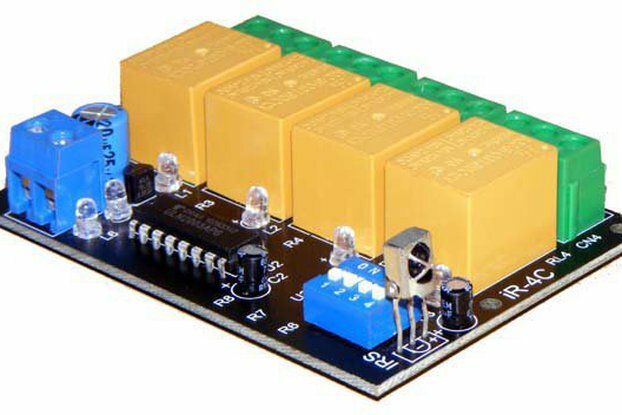 As the codes are programmable very easily, this board can be used with any programmable IR transmitter. The board is also having default codes inbuilt so that you can use our standard RC5 transmitter handset without any kind of changes in factory supplied board. You can use our IR remote handset ( to be purchased separately from our Accessories section ) to control this board's default settings. 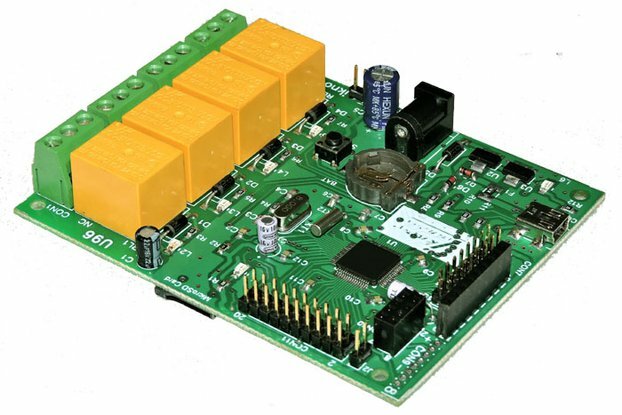 You can download the User Manual of this 8 channel IR remote controlled relay board iR-8R-V from our download section at http://iknowvations.in/downloads/.